The Nova Star returns to Portland on Sept. 8, 2014. 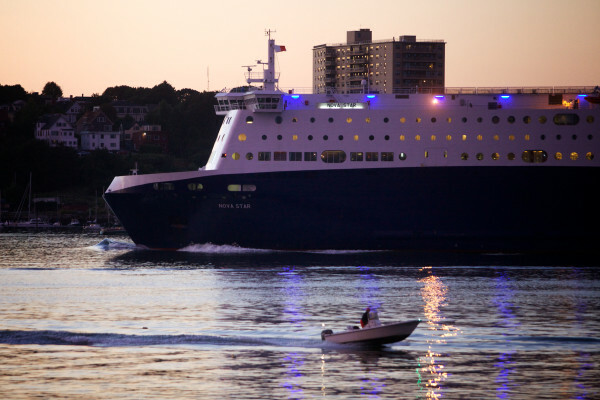 PORTLAND, Maine — The province of Nova Scotia will end its relationship with the Maine-based Nova Star Cruises after two sailing seasons, choosing to negotiate with the company that operated the earlier high-speed Cat ferry for the 2016 season. Geoff MacLellan, the province’s minister of transportation, announced Thursday afternoon that his staff selected Bay Ferries Ltd., owned by CEO Mark MacDonald, to negotiate a possible contract to operate a ferry between Maine and Nova Scotia. The Cat ferry previously ran from Nova Scotia to Portland and Bar Harbor from 2006 to 2009. It’s not clear if Bar Harbor stands to see that service return. MacDonald issued a statement Thursday stating the company is “very pleased” to enter negotiations with the province. The company and provincial officials said they would not provide further details on the route or contract until negotiations are complete. Bay Ferries edged out four other proposals, including the current operator, Nova Star Cruises. It operates two ferries connecting Nova Scotia to New Brunswick and to Prince Edward Island. Mark Amundsen, CEO of Nova Star Cruises, said in a prepared statement that the company was disappointed by the decision. A company led by the operators of The Cat’s predecessor, the Scotia Prince, had also made prior solicitations to the province, and the company’s leader said early this year that it would stay in the running for future bids. The province did not disclose each bidder in its statement Thursday. The service’s passenger count was a key part of its overall finances. MacLellan previously said the province was focused on incrementally working to reduce the need to subsidize a ferry service. On Thursday, he said the province thinks Bay Ferries is best positioned to do that. MacLellan said that the ferry service would continue next year. “Bay Ferries Limited has the experience, expertise, industry relationships and much of the operational infrastructure already in place, such as a reservations system, that would allow them to hit the ground running. There will be a service out of Yarmouth (Nova Scotia) for 2016,” MacLellan said in a news release.